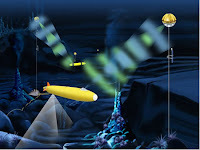 In a technological advance that its developers are likening to the cell phone and wireless Internet access, Woods Hole Oceanographic Institution (WHOI) scientists and engineers have devised an undersea optical communications system that—complemented by acoustics—enables a virtual revolution in high-speed undersea data collection and transmission. Along with the “transfer [of] real-time video from un-tethered [submerged] vehicles” up to support vessels on the surface, “this combination of capabilities will make it possible to operate self-powered ROVs [remotely operate vehicles] from surface vessels without requiring a physical connection to the ROV,” says WHOI Senior Engineer Norman E. Farr, who led the research team. This will not only represent a significant technological step forward, but also promises to reduce costs and simplify operations, they say. Compared to communication in the air, communicating underwater is severely limited because water is essentially opaque to electromagnetic radiation except in the visible band. Even then, light penetrates only a few hundred meters in the clearest waters; less in sediment-laden or highly populated waters. Consequently, acoustic techniques were developed, and are now the predominant mode of underwater communications between ships and smaller, autonomous and robotic vehicles. However, acoustic systems—though capable of long-range communication—transmit data at limited speeds and delayed delivery rates due to the relatively slow speed of sound in water. Now, Farr and his WHOI team have developed an optical communication system that complements and integrates with existing acoustic systems to enable data rates of up to 10-to-20 megabits per second over a range of 100 meters using relatively low battery power with small, inexpensive transmitters and receivers. The advance will allow near-instant data transfer and real-time video from un-tethered ROVs and autonomous underwater vehicles (AUVs) outfitted with sensors, cameras and other data-collecting devices to surface ships or laboratories, which would require only a standard UNOLS cable dangling below the surface for the relaying of data. This would represent a significant advance, Farr says, in undersea investigations of anything from the acidity of water to indentifying marine life to observing erupting vents and seafloor slides to measuring numerous ocean properties. In addition, the optical system would enable direct maneuvering of the vehicle by a human. Co-investigator Maurice Tivey of WHOI adds that “underwater optical communications is akin to the cell phone revolution…wireless communications. The ability to transfer information and data underwater without wires or plugging cables in is a tremendous capability allowing vehicles or ships to communicate with sensors on the seafloor. When the vehicle goes out of optical range, it will still be within acoustic range, the researchers said. Because it enables communications without the heavy tether-handling equipment required for an ROV, the optical/acoustic system promises to require smaller, less-expensive ships and fewer personnel to perform undersea missions, Farr said. This July, WHOI plans the first large-scale deployment of the system at the Juan de Fuca Ridge off shore of the Northwestern United States. The WHOI team will employ the human occupied vehicle (HOV) Alvin to deploy the optical system on a sub sea data concentrator to collect and transmit geophysical data from wellheads situated at the undersea ridge.